Fig. 1. 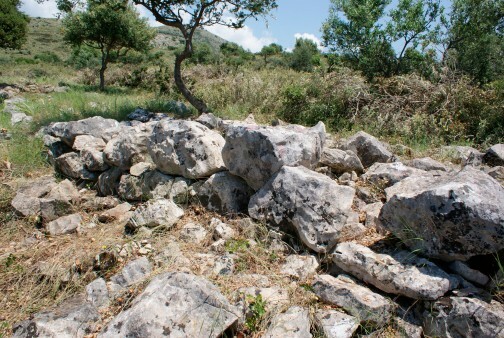 Α general view of the “Treis Ekklesies” locality. Old Pleuron is in the background and New Pleuron on the left. New Pleuron is one of the most extensive ancient cities in Aetolia, with an impressive fortification wall excellently preserved. References in Homer (note 1) and evidence in two tablets from Pylos (note 2) point to Pleuron’s importance since the Mycenaean era. The city also had a port (note 3) which is located at “Skali” (Step) locality in Messolonghi. 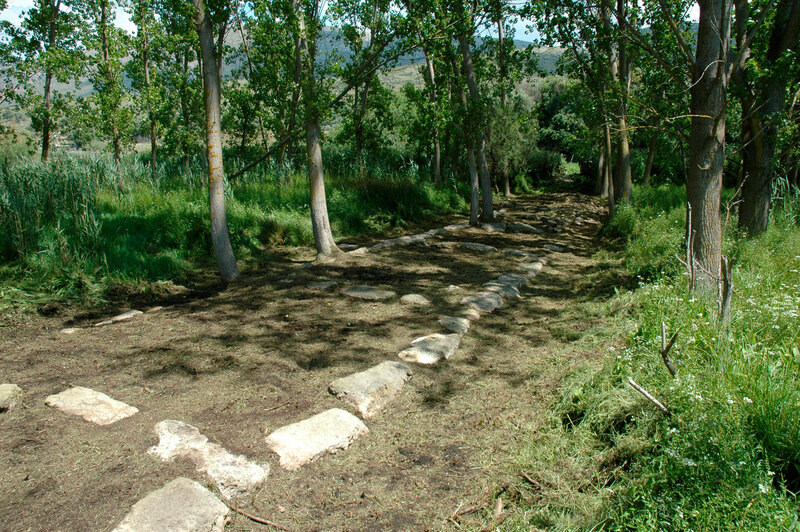 A rescue excavation began occasioned by the construction of the Ionia Motorway and its crossing through “Treis Ekklesies” or “Skali” locality by Messolonghi, within the borders of the declared archaeological area of Old and New Pleuron, where part of the ancient fortification wall with rectangular towers dated to the Hellenistic period is preserved (note 4, fig. 1). Prevailing opinion has it that this location can be identified as the port of ancient Pleuron. From the open sea the ships reached the harbour via a canal which provided a simple and cheaper form of transport (note 5). Today there are traces of this canal that was used up to the time of the Greek Revolution (note 6). The wall stretches to the left and right of the Antirrion-Ioannina highway and its best preserved part is located to the southwest (fig. 2). Its orientation is NE-SW, it is approximately 120m long and is reinforced by a rectangular tower (note 7). In 2011, apart from the extensive cleanings that revealed it in its entire length, two trial foundation trenches were opened on its outer face. The few architectural remains that emerged are a wall 0.85m wide, very close to the outer face of the fortification wall, as well as some fragmentary walls made of irregular stones of various sizes and of slipshod workmanship which were found in the middle of the trenches. Nevertheless it is interesting to study the pottery and the finds from these two trial trenches because, according to one preliminary examination, they belong to a period that predates the wall’s construction in the Hellenistic era. 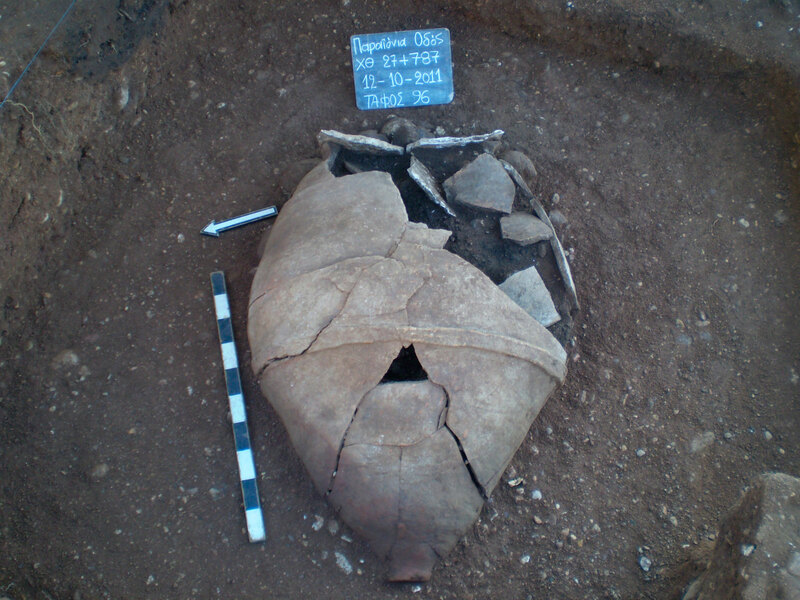 Apart from the large quantity of unpainted and decorated Hellenistic pottery found on the upper layers, pottery clearly dating to the Prehistoric period started to be collected from the deeper layers of the trench, at the level where the fragmentary walls appeared up to the depth where the excavation was completed. As the study of this pottery is at a preliminary stage and its preservation has not yet been completed, its exact dating cannot be stated with certainty. Some sherds definitely belong to the Middle Bronze Age without, however, excluding a Mycenaean date for some decorated sherds. Several of these sherds show strong traces of burning. Apart from pottery, flint tools were found as well as obsidian blades and cone shaped clay spindle whorls. In another trial trench in the western corner of the rectangular tower, the bedrock on which the tower is mounted was unearthed, as well as a wall about 6m long which touches the tower’s western corner, with a direction from SE to NW. This wall is made of fallen stone blocks from the tower and was obviously constructed in later years. A large amount of pottery from this trench includes unpainted and decorated Hellenistic sherds. Among the small finds are a silver coin possibly belonging to the Achaean League, two copper coins, nails and other iron objects. The tower’s present height is 3.20 m, its long side measures 6.75m and is built according to the pseudo-isodomic system. Big blocks of local limestone with a grey patina have been used for its construction. In fact the edges of the corner blocks are bevelled with a chisel (like the towers of New Pleuron), a feature known from other Aetolian fortifications. The excavation extended to the right and left of the preserved part of the wall achieving interesting results as new parts of the wall were unearthed. A new part with a length of almost 90m and a width of 4m (fig. 3) was revealed on the swampy plain area, which lies to the west of the hill, facing the lagoon. The wall is covered most of the year by water, due to winter rainfalls and because it is located in an area planted with poplar trees. The wall has two faces and the space between them is divided by internal walls running from face to face according to the emplecton style, which occurs in other Aetolian and Acarnanian fortification walls as well. Only one row of stone blocks is visible from both its faces. Today 7 or 8 of the internal walls are visible, made of large stones similar to those of the wall’s faces. This part of the fortification is not recorded in the plans by Noack and A. Portelanos. Finally, from the opposite direction, NE of the existing highway of Antirrion-Ioannina, on a sharply sloping hill, work focused on cleaning another section of the wall and three towers (fig. 4). This part of the wall is built in a different style in comparison with the one described above. Its length, as preserved, is 243m, while its width varies from 2.50 to approximately 3m. It is made of irregular rough stones of different sizes, which create neither a face nor smooth or flat surfaces suitable for bearing the stones of the upper rows. Unlike the wall, however, the towers are made of big rectangular ashlars in the pseudo-isodomic style. Maybe this is why they are considered as a later addition. The tower’s corner stones are not bevelled in the typical manner with a chisel, while in their interior can be seen cruciform walls to achieve better reinforcement of the tower walls (this is a feature also found in the towers of New Pleuron). Inside the tower, circular walls are to be found with an internal diameter of almost 2.60m. At a distance of almost 31m to the NW, a new part of the wall was located during cleaning operations. It is approximately 150m long and almost 2.80m wide. Investigations to the north have not been completed, while they have been interrupted to the south by an extremely steep natural rock formation at this spot. Research in this area is to be continued with the carrying out of new trial trenches. Our goal is to locate and date remains that can clearly be linked to the site of the port (note 8). Another large road work being carried out in Aetoloakarnania is the “Paraionian Highway – St Elias’ tunnel road connections” which started in July 2008 and concerns the construction of a new road which will connect the Naval Industrial Zone of Platygiali at Astakos with the Ionia Motroway. The construction of this new road is expected to be completed next year. 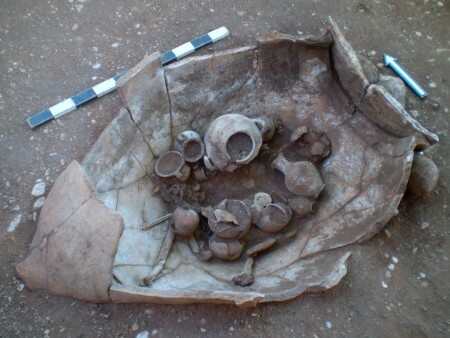 During the carrying out of these works, antiquities were discovered in three different locations within walking distance from each other, near the modern village of Kefalovryso by Stamna. This is an already known important archaeological site dated to the Dark Ages with evidence from the Mycenean period, situated at a short distance from St Elias locality, where five Mycenaean tombs have been excavated (note 9). The new data that came to light during the carrying out of this work is proof of the area having already been inhabited since the Middle Helladic period, as well as new evidence about habitation in the Aetolian countryside in Hellenistic times. As work began, a part of a Protogeometric cemetery was located, belonging to the extended, already known, cemetery of that period, a large part of which had been excavated in the past (note 10). Its new part covers an area of 4,800 sq.m. (over one acre) and to date 103 graves have been revealed about 1.50-2.50 m beneath the modern ground surface (fig. 5). There are large numbers of pithoi burials followed by cist graves. 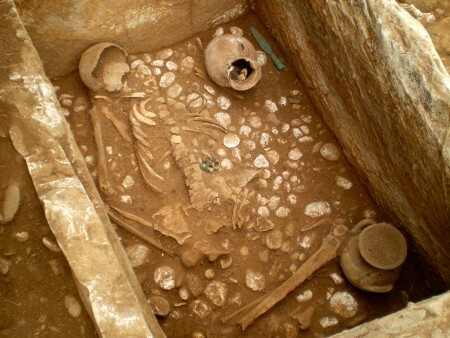 Sixty six pithoi burials were found in situ, placed horizontally on the ground, most of them well preserved. They are relatively small, 0.50m high with a diameter of 0.35 to 1.28m ending in pointed toes, while the larger ones are decorated with horizontal relief rings (fig. 7). Their opening was sealed by a limestone slab or, in some cases, by a larger stone in the shape of a stopper. Above them rose a mound of earth while their location was marked by a small heap of stones like a gravestone (sema). Twenty three carefully constructed graves belong to the cist graves type (fig. 8). The walls of the cists are made up of single limestone slabs (only one of them is built of sandstone-psammite). They each used a limestone slab as a covering and their floor was formed by small pebbles. They were organized in clusters, including graves of all types and orientation, and none had been plundered. They contained, for the most part, a single burial with the deceased placed in a fetal position either on his side or back. Only three pithoi contained secondary burials. No signs of cremation were found in these graves, which was, nevertheless, a well known practice in this cemetery (note 11). The dead were buried along with clay vases and spindle whorls, gold, bronze and iron items for clothing and adornment such as pins, buckles, hair rings, rings, bracelets, bronze and iron weapons such as swords, spear heads and knives. While the offerings in the pithoi burial included mainly clay pots, most of the jewellery and weapons were found in the cist graves, a fact which possibly reflects different social and economic status. Most of the artefacts are extremely well preserved, owing to the particular composition of the soil in this area. The clay vases belong to the usual types for this period, namely oinochoai, prochoi, small amphorae, kantharoi, cups, askoi, flasks and other, decorated in styles already known from that same cemetery as well as from those of neighbouring areas such as Palaiomanina (note 12), Pleuron (note 13), and Kalydon (note 14), all belonging to the category of the so called «Western Koine»( note 15). Two large apsidal buildings, both on the same axis, with a north to south orientation were unearthed a short distance to the south. Their walls which are 0.50-0.65m thick, were made of fluvial pebbles and their surviving height is barely 0.20-0.40m. The pottery found in the buildings’ interiors is dated to the Middle Helladic period (note 16). 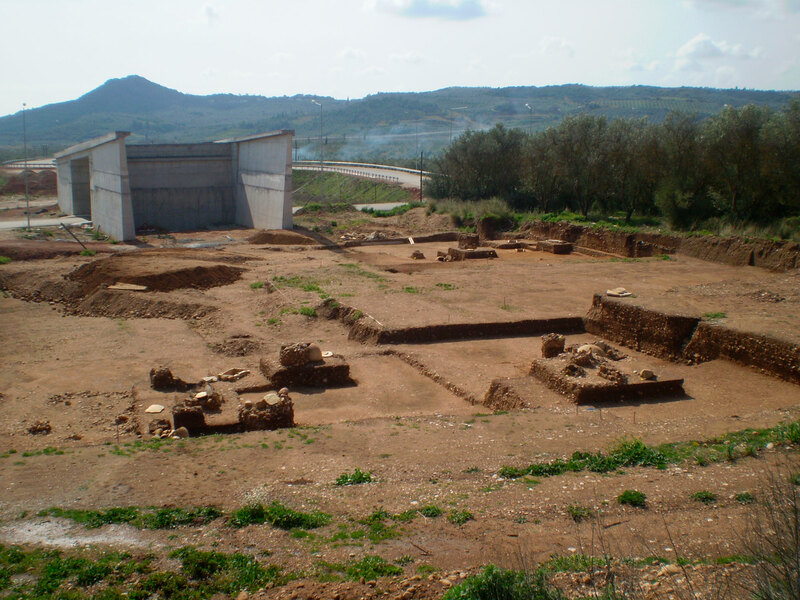 Finally, about 500m to the East, a Hellenistic farmhouse was investigated (note 17). The building, measuring 12mx11.50m, was found one metre beneath ground surface and consisted of at least four rooms. The walls, preserving only their foundations, were built of rough stones found in the wider area. In one of the rooms (A) a cistern measuring 1.20×1.05m was discovered as well as part of a pebble floor in an adjoining room. Room C was used for storage as two pithoi were found in situ vertically placed on the ground. Moveable finds include the usual farmhouse equipment such as clay vases for everyday use and storage vessels, clay loom weights, stone mills for grinding, iron nails and lead joint, as well as sparse jewellery belonging to the tenants. Sea shells were also found, which were possibly connected to the functioning of the cistern. In the area around the building, parts of two drainage pipes were unearthed as well as evidence that indicates the existence of more auxiliary, makeshift structures. 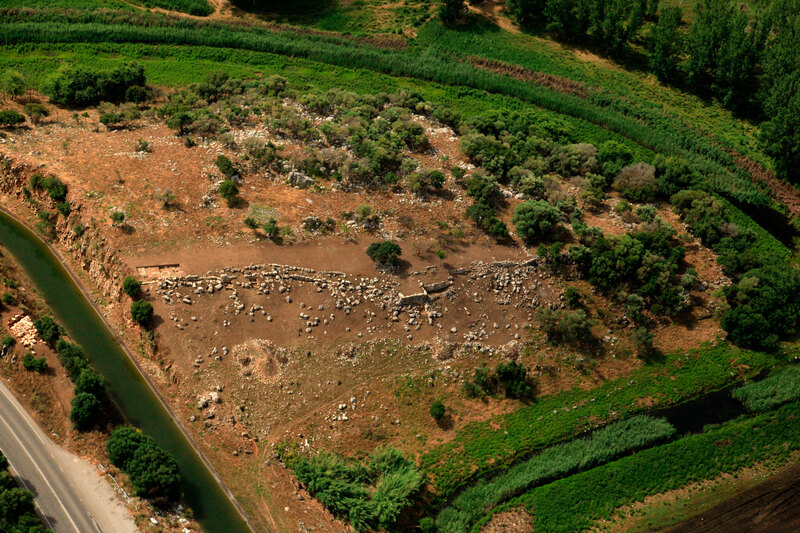 This new data is added to the already rich archaeological background of the area around the inlet of the bay of Aitolikon. 1. Homer’s Iliad B, lines 638-644. Ancient Pleuron is first mentioned by Homer in the catalogue of Greek ships that took part in the Trojan war. In rhapsody B of the Iliad Homer mentions the five cities of Aetolia, Pleuron, Olenos, Pylene, Chalkida and Kalydon which sent forty ships commanded by king Thoas. Another, this time indirect, reference to the ancient city is to be found in Homer, as the name Pleuronios, indicating nationality (he who comes from Pleuron) is next to the name of an inhabitant of the city, "Angaios the Pleuronios" who took part in athletic games at Vouprasio of Elis. 2. Ventris, Chadwick 1973, pp 138, 145, 430. The first tablet lists the military forces that have taken on the defense of the coastal parts of Pylos, and among the hoplites and officers of Pylos the name of an officer from ancient Pleuron is mentioned. The second tablet lists thirty rowers who are to go from Plylos to the city of Pleuron. 4. Mastrokostas 1968, p. 277, table 221a. 5. The canal can be traced to this day, see. Αλεξανδροπούλου 1965, pp. 208-211 and Αλεξανδροπούλου 2000, p. 45. 6. Αλεξανδροπούλου 1993, p. 64. 7. See Noack plan, entries «Pleuron», Kirsten 1951, and Πορτελάνος 1998, pp. 217-226. 8. 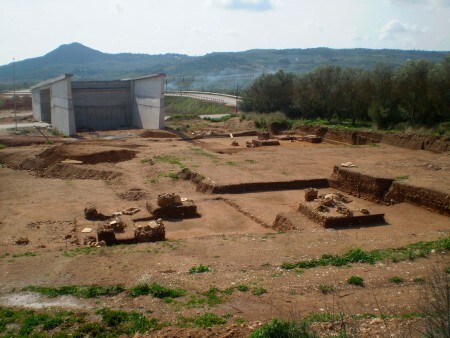 The first presentation of the conclusions of the excavation conducted at “Treis Ekklesies” locality was made by the undersigned at the 4rd AETHSE in Volos last March having as its subject “Kalydon-Alikyrna-Pleuron-Stamna: the latest research during the construction of Ionia Motorway and Paraionia Highway”. 9. Σταυροπούλου-Γάτση 2007, p. 275. 10. Brought to light for the first time by Euthymios Mastrokostas, see Μαστροκώστας 1969,while in the decade of the 1990s another part was investigated by Lazaros Kolonas, see Κολώνας, Χριστακοπούλου 1999. 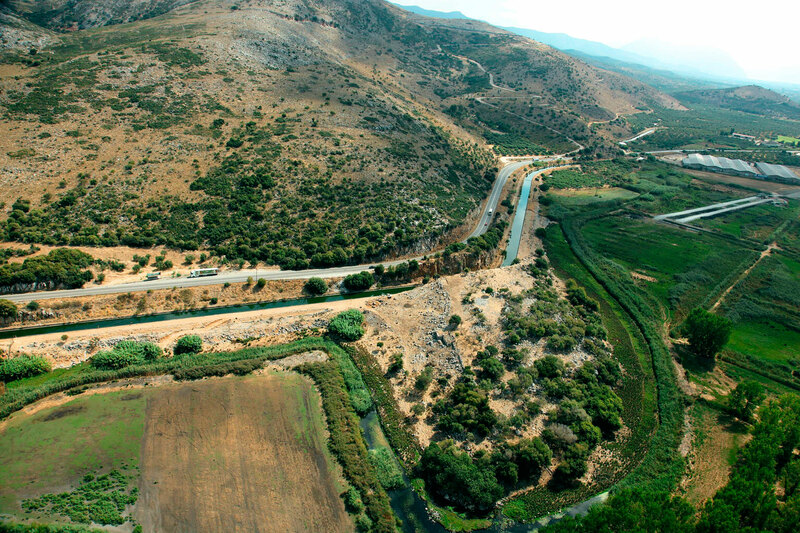 An intensive excavation was carried out in the framework of the roadworks “Wide Agrinio Bypass, Section Kefalovryso-Angelokastro” where over 500 graves were unearthed in this area, see Πετρόπουλος 2003 and Χριστακοπούλου-Σωμάκου 2009. 12. Μαστροκώστας 1969β, p. 323. 15. Γκαδόλου 2008, pp. 287-88. 16. Μαρία Σταυροπούλου-Γάτση, Archaeologikon Deltion 2010 (forthcoming volume). 17. Μαρία Σταυροπούλου-Γάτση, Archaeologikon Deltion 2008-2009 (forthcoming volumes). Αλεξανδροπούλου 1965: Σ.Κ. Αλεξανδροπούλου, Η Σκάλα του Ανταιλικού, Παρνασσός, vol. Ζ΄, no. 2, April-June1965. Αλεξανδροπούλου 1993: Σ.Κ. Αλεξανδροπούλου, Νότια Αιτωλία. Το οδικό δίκτυο έως τα πρώτα μετεπαναστατικά χρόνια, Athens 1993. Αλεξανδροπούλου 2000: Σ.Κ. Αλεξανδροπούλου, «Τα λιμάνια της προχριστιανικής εποχής», Αιτωλοακαρνανικά Μελετήματα, Athens 2000, p. 45. Βικάτου 2012 (forthcoming): Ο. Βικάτου, «Καλυδώνα-Αλίκυρνα-Πλευρώνα-Σταμνά: Οι τελευταίες έρευνες στο πλαίσιο κατασκευής της “Ιόνιας” και της “Παραϊόνιας” οδού», Minutes of 4th AETHSE 2009-2011 (Volos, 15-18 March 2012). Γκαδόλου 2008: Α. Γκαδόλου, Η Αχαΐα στους πρώιμους ιστορικούς χρόνους. Κεραμική παραγωγή και έθιμα ταφής, Athens 2008. Δεκουλάκου 1982: Ι. Δεκουλάκου, «Κεραμική 8ου και 7ου αι. π.Χ. από τάφους της Αχαΐας και της Αιτωλίας», Estratto dall’ Annuario della Scuola Archeologica di Atene e delle missioni Italiane in Oriente, Volume LX N.S., XLIV, pp. 219-236. Kirsten 1951: E. Kirsten, «Pleuron», RE 41, 261-262. Κολώνας, Χριστακοπούλου 1999: Λ. Κολώνας, ΄Ολγα Χριστακοπούλου, «Σταμνά», ΑΔ 49 (1994), Χρονικά Β 1, pp. 242-43. Μαστροκώστας 1968: Ε. Μαστροκώστας, ΑΔ 23 (1968), Χρονικά, p. 277. Μαστροκώστας 1969α: Ε. Μαστροκώστας, «Πυλήνη», ΑΔ 22 (1967), Χρονικά Β2, p. 320. Μαστροκώστας 1969β: Ε. Μαστροκώστας, «Παλαιομάνινα», ΑΔ 22 (1967), Χρονικά Β2, p. 323. Πετρόπουλος 2003: Μ. Πετρόπουλος, «Σωστικές ανασκαφές στο πλαίσιο των έργων ΠΑΘΕ, γέφυρας Ρίου-Αντιρρίου, Ιόνιας Οδού (ή Δυτικού Άξονα)», Αρχαιολογικές Έρευνες και Μεγάλα Δημόσια Έργα. Αρχαιολογική Συνάντηση Εργασίας (Επταπτύργιο Θεσσαλονίκης, 18-20 September 2003), Πρόγραμμα/Περιλήψεις, 37-8 και Λεύκωμα Πινακίδων, 2003, p. 53. Πορτελάνος 1998: Α.Κ. Πορτελάνος, «Οι αρχαίες αιτωλικές οχυρώσεις» (unpublished phd thesis), Athens 1998. Σταυροπούλου-Γάτση 2007: Μ. Σταυροπούλου-Γάτση, «Σωστικές ανασκαφές της ΛΣΤ΄ ΕΠΚΑ Μεσολογγίου στο πλαίσιο της κατασκευής δημοσίων έργων», Τα Αιτωλικά, Σεπτέμβριος-Δεκέμβριος 2007, issue no 9, pp. 271-284. Stavropoulou-Gatsi 2011: M. Stavropoulou-Gatsi, «Thirty Protogeometric Vases from Kalydon in Aitolia», στο S. Dietz, M. Stavropoulou-Gatsi (eds. ), Kalydon in Aitolia I, Monographs of the Danish Institut at Athens, 12.1, pp. 279-299. Χριστακοπούλου 1996: Γ. Χριστακοπούλου, «Σωστικές ανασκαφές στη Σταμνά και το Αγγελόκαστρο Αιτωλοακαρνανίας», Minutes Α΄ Αρχαιολογικής Συνόδου Νότιας και Δυτικής Ελλάδος (Patra, 9-12 June 1996), Athens 1996, pp. 511-518. Χριστακοπούλου 1999: Γ. Χριστακοπούλου, «Πρωτογεωμετρικός τάφος στη Σταμνά Μεσολογγίου», στο Ν.Χρ. Σταμπολίδης (ed. ), Πρακτικά Διεθνούς Συνεδρίου «Οι Καύσεις στην Εποχή του Χαλκού και την Πρώιμη Εποχή του Σιδήρου» (Ρόδος 29 Απριλίου-2 Μαΐου 1999), Athens 1999, p. 1-6. Χριστακοπούλου-Σωμάκου 2009: Ό. Χριστακοπούλου-Σωμάκου, Το Νεκροταφείο της Σταμνάς και η Πρωτογεωμετρική περίοδος στην Αιτωλοακαρνανία (doctoral thesis), Athens 2009. Ventris, Chadwick 1973: M. Ventris, J. Chadwick, Documents in Mycenaean Greek, Cambridge at the University Press, 1973.